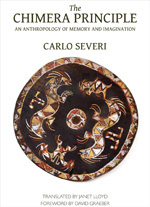 Chicago, University of Chicago Press, 2015, 375 p.
Available in English for the first time, anthropologist Carlo Severi’s The Chimera Principle breaks new theoretical ground for the study of ritual, iconographic technologies, and oral traditions among non-literate peoples. Setting himself against a tradition that has long seen the memory of people “without writing”— which relies on such ephemeral records as ornaments, body painting, and masks — as fundamentally disordered or doomed to failure, he argues strenuously that ritual actions in these societies pragmatically produce religious meaning and that they demonstrate what he calls a “chimeric” imagination. Deploying philosophical and ethnographic theory, Severi unfolds new approaches to research in the anthropology of ritual and memory, ultimately building a new theory of imagination and an original anthropology of thought. This English-language edition, beautifully translated by Janet Lloyd and complete with a foreword by David Graeber, will spark widespread debate and be heralded as an instant classic for anthropologists, historians, and philosophers.